I love pears. When it’s “pear day” at school I always grab two. However, this has very little to do with my love of fruit. Other than the fact that these cake toppers are in fact…you know…pears. These cutie cake toppers and nonbreakable hand-stamped pears that are about 4 inches tall. The great thing about these toppers are that they are lightweight, so they can go on any cake. 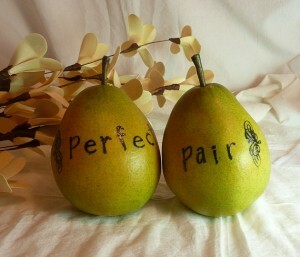 The pears are made by Aphrodite Canvas and you can visit their Etsy site here. While this particular listing is sold out hopefully they’ll be back in stock soon!